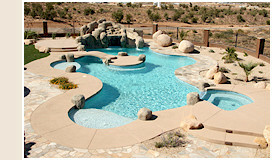 Some of the most popular swimming pool and spa designs in the Phoenix area are the free-form lagoon style pools. Freeform pools tend to create a more relaxed atmosphere through the use of curves and smooth flowing lines. It is a more nontraditional look which you would associate with a natural pond. The shape of a freeform pool can be determined by the space available or can be custom designed to link the different features in your yard such as a patio, outdoor kitchen or lounge area. Transitioning the edges of this pool to your landscape with natural rock and stone will create the feeling of a natural oasis. Phoenix has quickly become one of the swimming pool and spa capitals of the U.S., with a huge number of swimming pools and spas being built each year. Selecting a pool company who can design your pool as well as incorporating all of the other aspects of your landscape and outdoor living area is known as the UNIQUE advantage. The UNIQUE design team will work with you to create a seamless plan for your entire pool, landscape and outdoor living project. Form, function and beauty will flow throughout your property as you embrace the outdoor Arizona lifestyle.